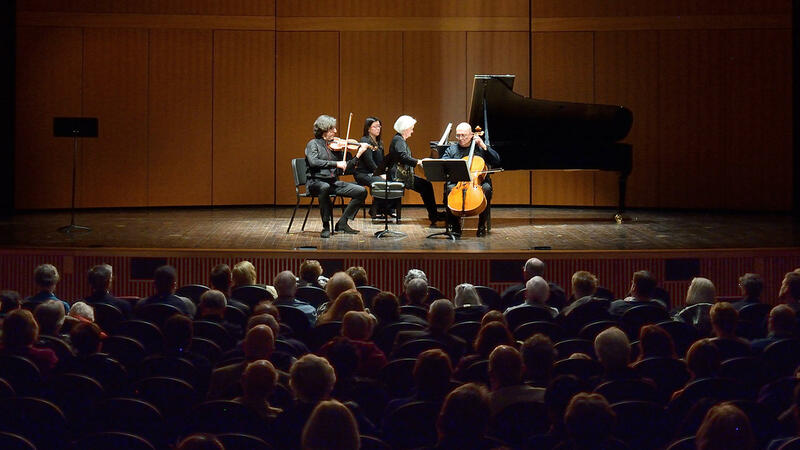 MSU faculty Dmitri Berlinksy, Deborah Moriarty and Suren Bagratuni perform works by Maurice Ravel during a West Circle Series concert at the Fairchild Theatre in the spring of 2015. A weekly hour of classical concerts from Michigan State University. Featuring faculty artists, student ensembles, and guests from around the world, captured in performance at Cook Recital Hall, Fairchild Theatre and Wharton Center Cobb Great Hall on the MSU campus. WKAR's Peter Whorf is the host. Fridays at 3pm on 90.5 FM WKAR Radio | This February, enjoy a weekly hour of classical concerts from Michigan State University hosted by WKAR's Peter Whorf! Fridays at 3pm on 90.5 FM WKAR Radio | This January, enjoy a weekly hour of classical concerts from Michigan State University hosted by WKAR's Peter Whorf! Friday at 3pm on 90.5 FM WKAR Radio | Take a break and enjoy the beautiful music from the Michigan State Symphony Orchestra! Fridays at 3pm on 90.5 FM WKAR Radio | This July, enjoy a weekly hour of classical concerts from Michigan State University hosted by WKAR's Peter Whorf! Fridays at 3pm on 90.5 FM WKAR Radio | This June, enjoy a weekly hour of classical concerts from Michigan State University hosted by WKAR's Peter Whorf!